Funny story… Back in 2003 I was working with a company who was going bleeding edge with ESX 2.1, which at the time I was a Windows admin in with a focus of data center workload migrations. They were virtualizing People Soft, Kronos, and a vast majority of the Active Directory servers. I was approached by my bosses boss to assist the group that was running the VMware environment, they had been experiencing serious performance issues for weeks. After a couple of hours of research online I determined what the issue was ( Incorrect share settings ) and made the corrections, solving the performance problems. A short while later, I was running the VMW environment as the primary admin. I fell in love with the tech the moment I started to work with it. The rest is history! I was never much of a cert person before the VCDX. I had my VCP2 and that was it, but the way the certification worked, how it is defended, that challenge really spoke to me. In the end it was really a personal goal, that mountain you climb because it is there. I am the type of person who is very driven and goal orientated, so I wanted to see if I had what it takes to be a VCDX. 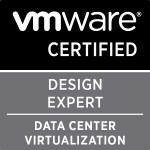 I decided to do the VCDX in January of 2013, but with starting a new role at VMware I didn’t want to jump right into it. I had a new day job to learn and do, so I really didn’t start the journey until October of 2013 with prepping for my VCAPs. I picked up both my DCD and DCA in November and December of 2013, I then started working on my design in January. From VCAP to VCDX was 12 months, 9 months solely on VCDX with 2 attempts. Do it for the right reasons. I have heard a lot of people say, “I want a raise” or “I want the bonus my work will give.” While those are nice, treat it like you would any college course or degree. It should not only be about getting the certification, but about how you grow and learn in the process. Do it because you not only want to prove what you are capable of, but that you also want to learn more in doing so. Honestly, nothing. In looking back on how I did things, some of it I did the hard way, but I learned a lot in doing so. Some people would think my answer here would be, “Not choke on my first attempt.” Though I would say that failure was a huge learning experience for me. It was a gut check for sure, but I learned a ton in that attempt that helped me to grow significantly.